Clark Derbes (b. 1978) is an emerging artist who lives in Burlington, Vermont. He is known for painting and his sculptures created from found wood. 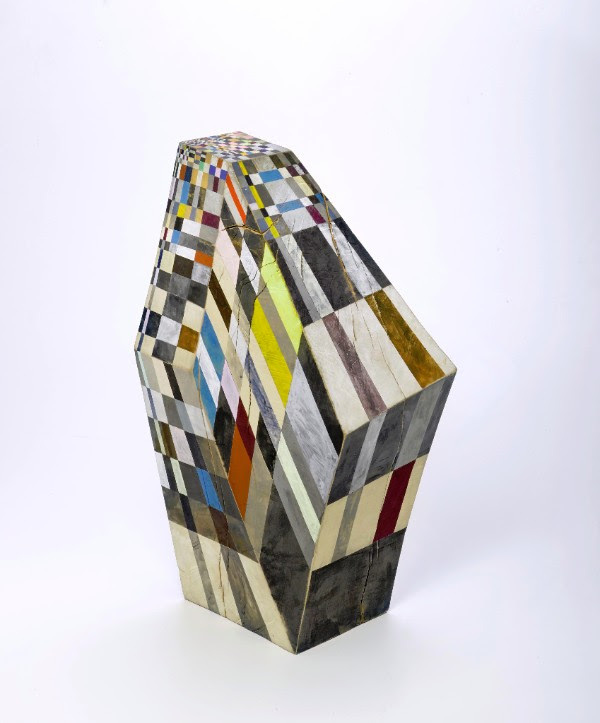 Initially carved using a chainsaw into a form known as a hypercube (a twelve-sided rectangular solid which Derbes stumbled upon in his quest for shaped surfaces on which to paint), these forms are further refined using a succession of mechanical and hand sanding to differing degrees of smoothness. Layers of synthetic gouache in freehand checkerboard patterns are applied with an improvisational spirit with a range of outcomes, some restrained and others vibrant and chaotic. The current exhibition combines a series of free-standing works, wall mounted reliefs and paintings on canvas. Derbes studied at Louisiana State University (BFA) and has had solo exhibitions in Massachusetts, Texas, Louisiana, Vermont and Georgia and was recently included in a group exhibition at the Fleming Museum in Burlington, Vermont.